These interactive, digital task cards are customized for your Google Classroom and/or 1:1 classroom. 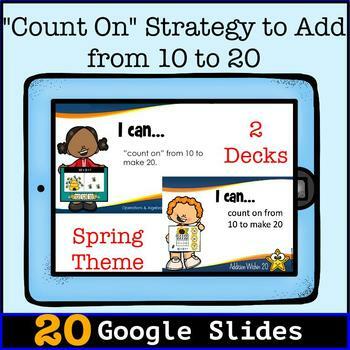 Give your students an opportunity to practice USING THE "COUNT ON"STRATEGY TO ADD with this fun deck. Designed for students learning ADDITION FACTS. "Counting on" is where you start with the larger number of the two numbers and count on the smaller number. Students look at the image of 10 bees or the 10 frame and count on to complete the addition sentence.They drag the red square to show their answer. WHY USE DIGITAL TASK CARDS? If sharing through Google Classroom, there is no need for PAPER! Students have 24/7 access and can work at home and school. They can work through the "slides", and start and stop as needed. When students have completed all slides, they submit their answers electronically, and you can easily keep track of students' progress through your teacher dashboard. ***Internet access and a Google account are needed to use this resource. Students will need individual Google accounts if you want each student to work on their own copy.